Comprehensive manufacturing delivers quality products. Unlike other plastics processors, we are more than injection molders. Tri-Mack offers a complete portfolio of manufacturing capabilities including injection molding, tool making, multi-axis CNC and water jet machining, NADCAP certified bonding, assembly and functional testing. 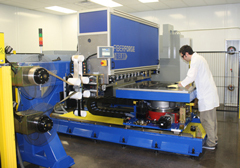 In our Advanced Composites Center, Tri-Mack offers state of the art thermoplastic composite processing. Here we use automated equipment to lay up, consolidate and form continuous glass and carbon fiber reinforced thermoplastics. Tri-Mack produces high performance components using unidirectional and fabric prepregs in materials such as PEEK, PEK, PPS and PEI. Our AS9100/ISO 9001-2008 certification reflects our commitment to quality. We use Six Sigma and Lean principles to deliver reliable, cost-effective manufacturing for your most demanding components. With such diverse capabilities, you get the benefits of working with a single vendor, streamlining development, improving quality and reducing cost. In addition, Tri-Mack’s unparalleled customer service is always available to support your critical needs. Put the Tri-Mack team to work for you and gain a time and cost advantage.